Mass Shootings Spur Movements, But Gun Violence Is Constant For Some Americans Some residents in Washington, D.C. — which faces daily gun violence — say their needs are being forgotten in the national conversation surrounding gun control. 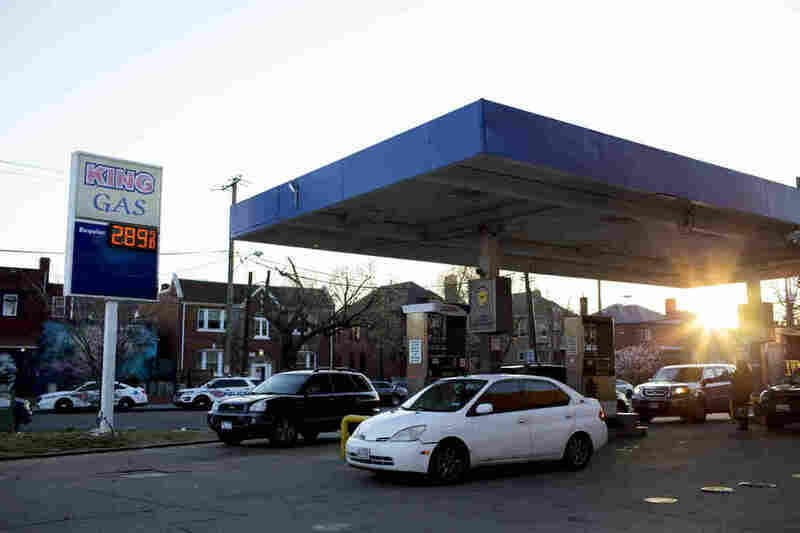 Martin Luther King Jr. Avenue in Washington, D.C., where Maleak Coffin was shot while pumping gas on Dec. 23, 2017. The nation's capital saw more than 100 people die from gunshot wounds between Jan. 1, 2017 and April 9, 2018. "There's a bullet hole in my child's car seat," Julie Humphrey Vallelunga posted on Facebook last month. "That bullet missed my neck by inches as I sat in my car at the intersection next to their school, waiting to pick them up a few minutes later." 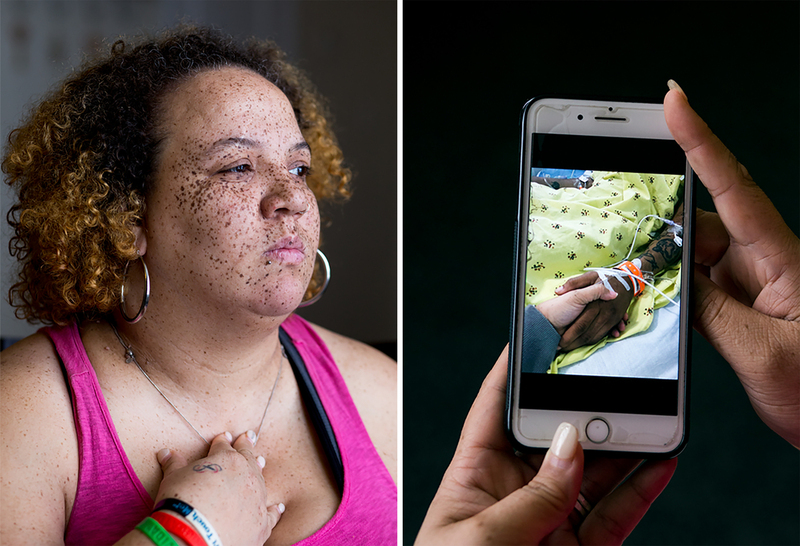 Humphrey Vallelunga saw the shooter a split second before her windshield shattered, but there was nothing she could do. Her children's school, Powell Elementary School in northwest Washington, went into lockdown, as did several other nearby elementary schools. Humphrey Vallelunga and others walked away from the shooting without any major injuries. But she wasn't the target of the shooter. "That bullet was aimed at someone," she says. "It missed that person, and that person survived. But if the person who fired that bullet had better aim that day, a teenager would be dead." Last month, thousands of teens gathered on Pennsylvania Avenue in downtown Washington, D.C., for the March for Our Lives rally — just four miles away from where Humphrey Vallelunga narrowly avoided a tragedy. The rally's mission was to address gun violence in schools, after a shooting that left 17 people dead at Marjory Stoneman Douglas High School in Parkland, Fla. According to The Washington Post there have been 130 school shootings — and as many deaths — in elementary, middle and high schools since 2000. "This is my life now," Tracy Coffin wrote in a Facebook post days after her 22-year-old son Maleak was shot on Dec. 23, 2017. "He was always talking about what he wanted to do...he wanted to be free," she said about Maleak. Tracy also lost the father of her daughter eight years ago to gun violence. But, Humphrey Vallelunga and others who live in Washington neighborhoods that face gun violence on a day-to-day basis say they don't feel included in the national conversation about guns. "They think we deserve the life we live"
According to the D.C. Metropolitan Police Department, 110 people were killed by guns in the nation's capital, between Jan. 1, 2017 and April 9, 2018. Other metropolitan areas have a similarly high volume of deaths involving a firearm, such as Chicago, which saw its deadliest year in two decades in 2016 and Baltimore, where 116 people have been shot and killed within the past six months. However, as national attention is directed toward #NeverAgain — the movement associated with March for Our Lives to raise awareness of mass shootings — some worry that local slayings are being neglected. "I think there are more conversations being had," says Justin Rydstrom, "but often, our students feel left out of those conversations." Rydstrom is executive director of the IDEA Public Charter School in northeast Washington. He says his students sometimes feel that they live in a community ravaged by gun violence. "It takes a mass shooting that is not in an inner city [for people to pay attention]. And our students and staff grow tiresome of it," Rydstrom says. When that "inner city" happens to be a hub for political activism like the nation's capital, local messages often are lost, residents say. "We live in these neighborhoods and people forget that," April Goggans says. "And some of us have been impacted by gun violence. Most of us." Goggans is a leader of Black Lives Matter D.C., as well as the founder of #KeepDC4Me. She and others from the area have been trying to address the issue of gun violence for years. But, she said their movements never gained traction in the same way the #NeverAgain movement or March for Our Lives did. 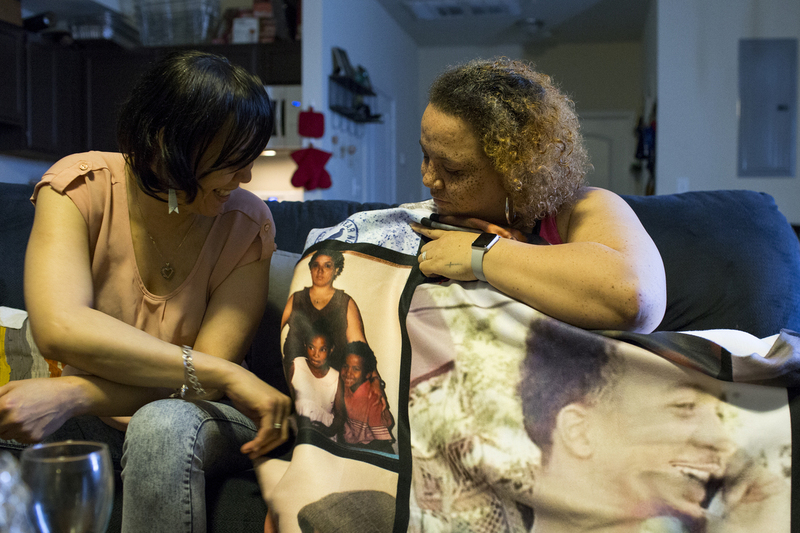 (Left) Stacy, and sister Tracy reminisce over a collage of photos of Maleak Coffin, who died three days after being shot in December. The blanket was gifted to the family by Maleak's girlfriend, Marshay Walker. "There were restaurants giving away free food. There were drivers giving away free rides," Goggans says. "And our kids were like 'but we deal with this every day, and most of the time people don't care because they think we deserve the life we live.' "
Goggans attended the march with BLM and students from Washington-area schools that wanted to participate. The march was positive, she said. The conversations were productive. But some of the Marjory Stoneman Douglas High School kids — particularly students of color — were left out. However, Goggans said that some of the students from Thurgood Marshall Academy, a public charter high school in southeast Washington, connected with survivors of the shooting at in Parkland, Fla.
"And that was really huge because they were feeling completely isolated," she says. "There are black kids that go to Parkland. Some of them were in the room where people died next to them. And you don't hear their stories." The students at Thurgood Marshall are perhaps a little too familiar with gun violence; two students have been killed in shootings within six months. Nineteen-year-old student Paris Brown was killed in Southeast Washington in January. 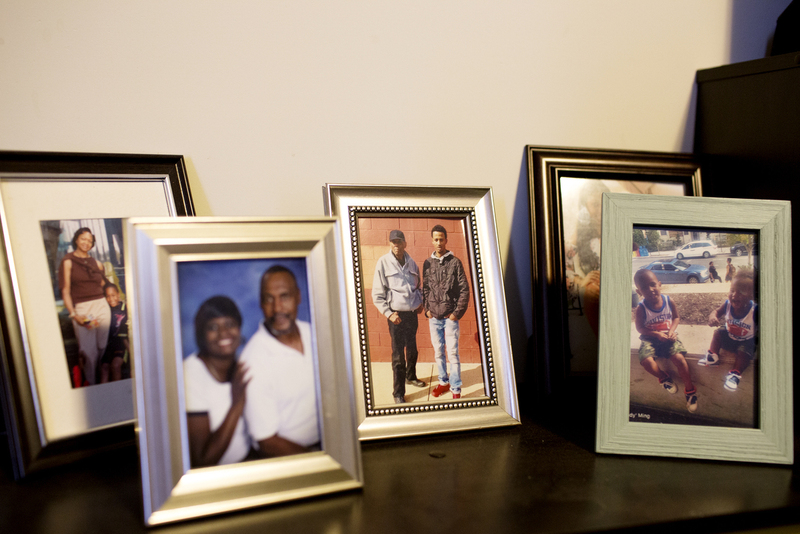 In September, 16-year-old Zaire Kelly was shot and killed as he walked home from school. His twin brother, Zion, still attends Thurgood Marshall and spoke at the March for Our Lives rally. "Many of the people who met with kids from Parkland knew Paris and Zaire really well," says Richard Pohlman, the executive director of Thurgood Marshall. "The biggest change I've seen is that our students felt a renewed focus," Pohlman says. "At the march, there were little orange pins that said LLZ and LLP ... for 'Long Live Zaire' and 'Long Live Paris.' "
Pohlman and the Thurgood Marshall staff tried to support students in their advocacy efforts. But this form of advocacy can be exhausting. Monique Walker-Riley, a psychotherapist in the area, said that the gun violence issue "weighs heavily on the youth in the area." "I see on social media on my feed ... young people exposing their fears, their concerns, their paranoia," she said. "Seeing friends not show up to school the next day, it can all lead to kids experiencing vicarious trauma." Walker-Riley explains that people within a community can be traumatized by violent acts, even if they were not personally involved. People such as Tracy Coffin and her sister, Stacy. The Coffins are overly familiar with gun violence in D.C. Stacy says her daughter's father was shot in the back of the head and killed in December 2000. Nine months later, the father of her son was shot six times and killed. Photos of the Coffin family in Tracy Coffin's home. "Their cases never came to justice," she says. "Being the woman in their life, I still have no idea what happened. I had to raise both of my children, and their fathers were murdered." Eight years ago, Tracy lost her daughter's father to gun violence. 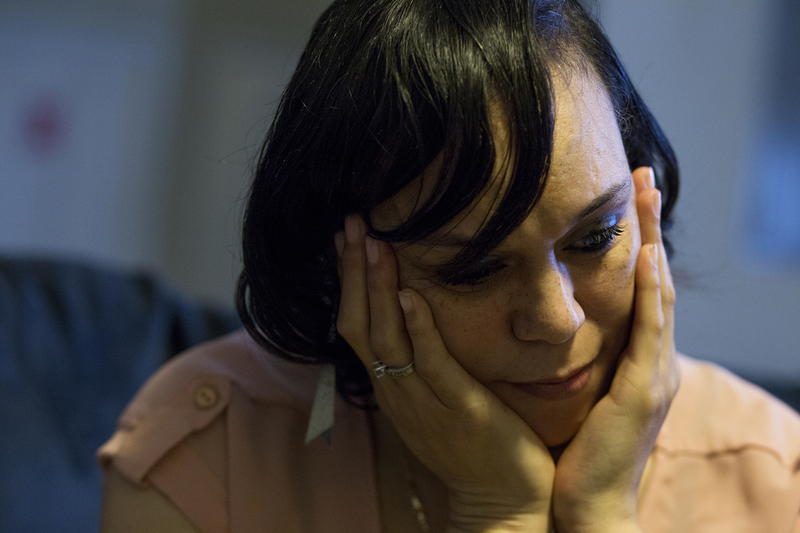 In December, Tracy buried her son, Maleak Coffin, who was killed in a shooting. "I'm tired of crying," Tracy says. "I'm tired of this." Stacy says her nephew was charismatic and was always "the life of the party." She affectionately calls him by his nickname, "Poppy." He died Dec. 26, 2017, three days after being shot in the head at a gas station. "We watched the videotape in court. You see three police cars literally riding down the street. And they still couldn't stop it," Stacy says. "You can put a man on the moon, but you can't stop gun violence? They did a war on drugs, but they can't do a war on gun violence?" Stacy says she doesn't feel that the national conversation about gun violence has extended to include neighborhood gun violence. Seemingly isolated incidents like the shootings that claimed the lives of her nephew and the fathers of her children are outside of the scope of the movement. Both the father of Stacy Coffin's son and the father of her daughter were shot and killed in southeast Washington more than a decade ago. Her nephew Maleak died from gunshot wounds in December. "I promised him...I would tell the world about him, that's what I said to him over and over again. I said that to him at his casket. 'I'm going to tell the world about you Poppy.' "
"You look at media and you're like 'really?'" she says. "What about my nephew? What about my son's father? What about my daughter's father? What about them?" She hopes that the actions of the students from Parkland are the beginning in a shift of that conversation. She was pleased to see the effort made to connect with students from the area who see gun violence every day. "They could have gone to any other school," she says. "But they went to Thurgood Marshall. They told them it was about them, too. That their lives mattered, too." Asia Simone Burns is a Digital News intern.